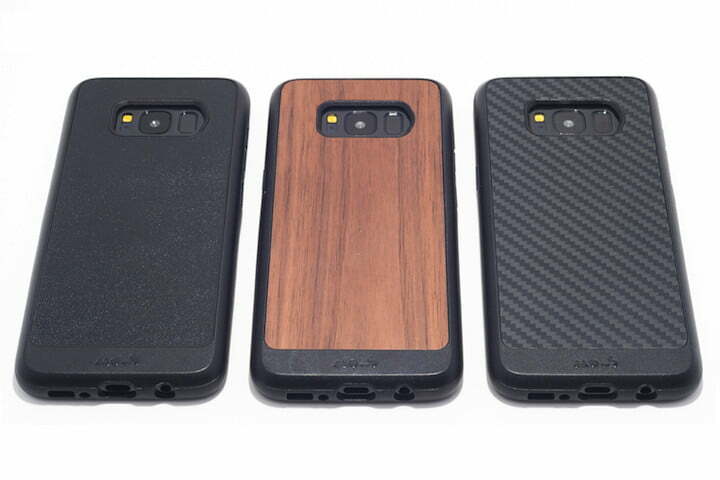 Our appreciation for Mous cases comes from our experiences using them to cover our iPhone, and we therefore recommend them for slipping over your equally breakable Galaxy S8. The case has a polycarbonate body with a TPU bumper, which cleverly hides a system called AiroShock, which absorbs shocks and drops very effectively. While the shock protection is great, the surprising part is how thin and light the Mous Limitless cases are, giving you all the benefits of a tough case without the drawbacks. The wood or leather on back is real too, which makes us love the carbon fiber model even more. These cases start from $40. Very few case manufacturers have Otterbox’s reputation for drop protection, and we found out why when we looked at how manufacturers test their rugged cases. If you’re looking for heavy-duty impact protection for the Galaxy S8, then Otterbox cases should definitely make your shortlist. The Commuter series is more manageable, as Otterbox has made the cases as slim as possible without compromising toughness. The case features Otterbox’s 2-layer protection and dust covers to keep dirt out of the smartphone’s ports. It comes in black, but you can also order it in a range of two-tone color combinations. One of the best rugged cases for the Galaxy S8, Pelican’s Voyager covers your phone from every angle and has a built-in screen protector and a holster. The back is transparent, but there’s a thick, protective frame with a soft touch finish that enhances grip. The buttons have tactile covers and the cut-outs are accurate, so you can use your S8 just fine with the case on, which is just as well, because it’s not easy to remove in a hurry. The holster also has a swiveling belt clip which can double up as a kickstand. This is a reliable option for drop protection and it comes with a lifetime warranty. At first glance, this case looks like your typical slim wallet case. The front cover allows you to keep two cards concealed and out of view for added safety. You can also take off that front cover when you don’t need it and turn this case into a simple, protective shell case. The Evo Wallet can resist drops from up to 10 feet, thanks to Tech21’s FlexShock technology. The Skinit Pro case gives you everyday drop protection, with raised front bezels to keep your screen safe. Skinit’s website features a customization tool that you can use to upload any graphic or picture that you want featured on your custom case. You can position and resize the picture to make the case look exactly the way you want to before placing your order. You can also browse the wide selection of ready-made cases that are already available on the website for $35. Samsung’s LED Wallet cover is unique among the best Galaxy S8 cases. The case has an inside pocket where you can store cards just like many other wallet cases, but its standout feature is the LED notifications. When you press the power button, the front cover LED lights will display things like the time, alarms, and also incoming calls, allowing you to swipe to answer or reject those calls. You can also designate LED caller ID icons to a specific contact using the LED icon editor app. The case comes in black, silver, blue, and orchid gray. We know you don’t want to cover that beautiful Galaxy S8, but you need proper drop protection, too. Incipio’s Reprieve case could be the perfect compromise. The back is crystal clear with a large opening for the camera and fingerprint sensor. Shock absorbing reinforcement is built into the enlarged corners which cushion your S8 from every angle in the event of a fall. The button covers are easy to use and the partially clear, and the malleable bumper section comes in a choice of different colors for a fun, sporty feel. Anyone concerned about dropping the S8 should have a look at UAG’s wares. These cases are really tough and practical, with reinforced corners, big rubber skid pads to prevent slips, and chunky button covers that are easy to feel and press. The openings offer easy access to all phone features and the case extends top and bottom to safeguard the screen. This opaque case comes in black, rust (orange), or white, but UAG also offers the translucent Plasma case in a few different shades. This wallet case combines style and functionality in a package that offers decent drop protection. It’s a folio-style case, in black, vegan (fake) leather, which opens to reveal a polycarbonate shell for holding your S8 securely in place. The cover offers four handy slots for cards and a full-length pocket at the back. You’ll find accurate cut-outs for the buttons, camera and fingerprint sensor on the back, as well as the ports. The design also allows you to prop your S8 in landscape easily, which is great for watching movies. If you like the leather look, but you want a durable, shell-style case, then this option from VRS Design should make your shopping list. It’s a polycarbonate shell with generous openings for your S8 camera, fingerprint sensor, all buttons, and ports. The back has a textured, polyurethane leather finish with neat, contrasting stitching. It’s slim and light, so it won’t provide rugged drop protection, but it should be enough to cope with minor bumps. It comes in black, or a brown and gold combination and costs $25. Here’s a tough case that combines multiple layers of protection to ensure that your S8 can survive drops from up to 10 feet. There’s a malleable, inner rubber, tough, poly-carbonate back, and an aluminum frame. The button covers are well-defined, and there are accurate cut-outs for the ports, camera, and fingerprint sensor. It’s a pretty chunky case, but X-Doria has added a touch of style with a panel on the back that comes in a choice of finishes, including rosewood, black carbon fiber, or black leather. You can still get dual-layer protection in a slim package with this case from Griffin. It protects against drops from up to 7 feet, but it’s very lightweight. There’s a layer of polycarbonate with flexible TPU around the outside which makes it easy to grip and comfortable to hold. You’ll find openings for the camera, fingerprint sensor, and ports are exactly where they should be, and there are individual button covers on the side for the volume and power buttons. This case comes in a range of color combinations with contrasting highlights and the Survivor logo on the back. Here’s an affordable protective case from popular manufacturer, Spigen. It meets military drop test standards, so your Galaxy S8 is safe in the event of a typical fall. The black inner shell is TPU with air cushions in the corners and there’s a polycarbonate layer to snap on top. You’ll find generous openings for easy access to ports and camera. The kickstand is handy for propping your phone in landscape view, but it is a bit flimsy. The back comes in a choice of six different metallic colors.